Sorry the blog has been a little quiet of late guys, I officially started year twelve last week and the work load has hit me like a tonne of bricks. As I learn to deal with homework again, and get used to doctor-ordered six am walks, I’ll start updating more regularly, I promise. 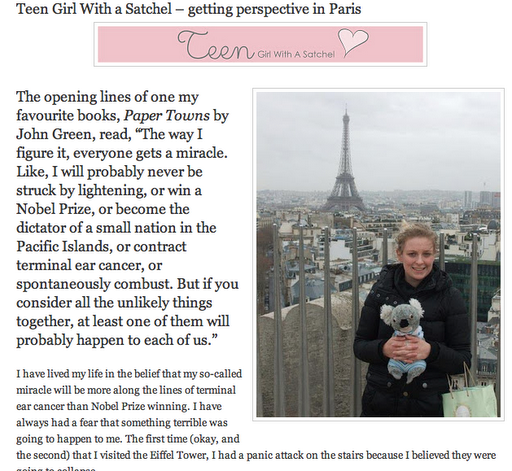 My Teen Girl With A Satchel column for January was posted last week, and is titled Getting Perspective In Paris. It’s all about how 2012 is going to be my Year Of No Fear (I’m only two years late to that party), and how going back to Paris helped me conquer some of my fears and showed me anything is possible. Last weekend I went with my Marauders to see the Doctor Who Symphonic Spectacular in Melbourne, and it was one of the most amazing things I have ever seen. I laughed, I cheered, I sobbed…It was absolutely brilliant. Even my mum, who refuses to watch Doctor Who with me, was in love with it. I found my future husband there as well. He hugged a Dalek. I’m pretty sure you can’t get much cooler than that. In other news, I got accepted into the Sydney Morning Herald Work Experience program today, so I’ll be heading to Newspaper Land for a week in April. I’ve only ever been a workie at magazines before, so I’m pretty excited to see how other forms of print journalism work. I wonder if I’ll get to find out who writes Column 8. Hmmm, that would be rather awesome. I have lots of reviews still to write on lots of lovely books, films, and TV shows I’ve been managing to fill my study time with. Speaking of filling my study time with procrastination, I’m coming to the heartbreaking realisation that I’m going to have to delete my tumblr account soon. Or maybe not delete…but get someone to change the password for me. It takes up way too much of my time, and as much as I love fandom, it can’t get in the way of my future.